Installing performance management and monitoring software may not be the same as implementing telemetry throughout an IT organization. As the scope of performance management and monitoring software evolves, investments in management software can provide rapid ROI; but realizing the full value of investments (VOI) in these solutions can be elusive. Return-on-investment (ROI) tends to get the lion’s share of attention, since it’s focused on hard dollars and net profit. 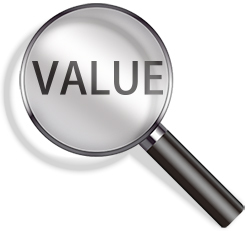 Value-of-investment (VOI) includes intangible benefits as well – ROI is a subset of VOI. The nature of the beast for many performance monitoring and management projects tends to start with “what can we monitor?” which is usually followed by a dizzying list of devices, systems and applications. This is quickly followed by implementation activities and monitoring instrumentation. Initial instrumentation may be simply providing a unified monitoring environment for physical and logical infrastructure, or is focused on a single system or platform. This is an incremental improvement, offers some immediate return on your investment in eG Innovations, and is usually the ROI driver. However, as we begin to go beyond individual components to IT systems (segments), to supporting IT services, to end-to-end IT services and ultimately to end user experience monitoring, the value of your investment in eG Enterprise compounds significantly. Just as eG Innovations’ performance monitoring software can help customers adopt a services orientation, it also provides a centralized telemetry infrastructure that has a proven record of adapting to new technologies. The intangible benefits of this include increased collaboration between IT technical domains, greater awareness of business impacts, acceleration of improvement efforts and cultural change. This can translate to increased IT innovation and can expand the value of investment far beyond the original ROI. 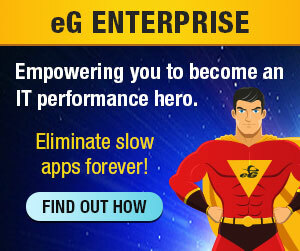 Leveraging eG Enterprise as part of an overall IT transformation, whether that be DevOps or ITSM, is an excellent way to get the maximum value out of your investment in the software. This ensures that the people and organizational aspects of realizing value on investment are addressed, and can spread those costs across the overall transformation program. So don’t give up on the quest to define IT services and/or establish a DevOps culture. 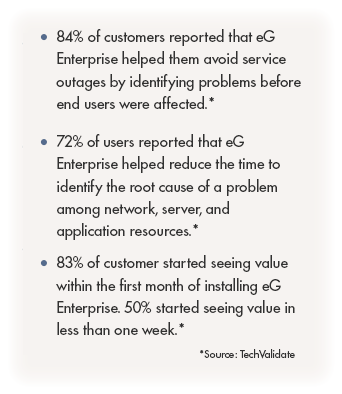 Leverage the eG Enterprise suite to help you establish a program of service targeting and improvement cycles that not only accelerates your ITSM initiatives but saves you money along the way.